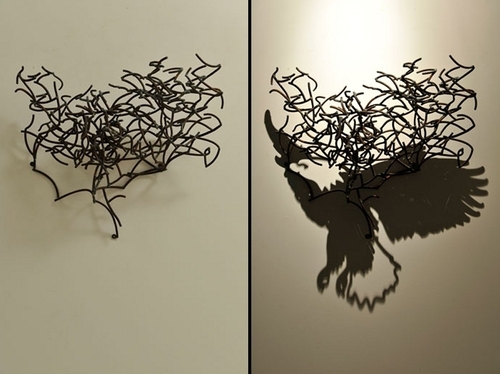 American Sculptor Larry Kagan started shadow sculptures and drawings by a happy coincidence. He originally wanted to make drawings and designs using steel wire, when he hung it up he noticed the shadow it cast and decided to make more of this process. The reason they are so mesmerising, is that the the wire sculpture has no resemblance to the shadow it casts. Kagan recants how in his art gallery he has to, some times, turn the lights on and off to prove it is not a trick. See the video below, for more information. We have created animations so that you can see the sculpture with and without the shadow.